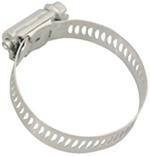 Screw: SAE 1018 case-hardened, hex-free chrome zinc-plated steel. Meets SAEJ1508 (supercedes Mill Spec WW-C-4408). All clamps come 10 per box.